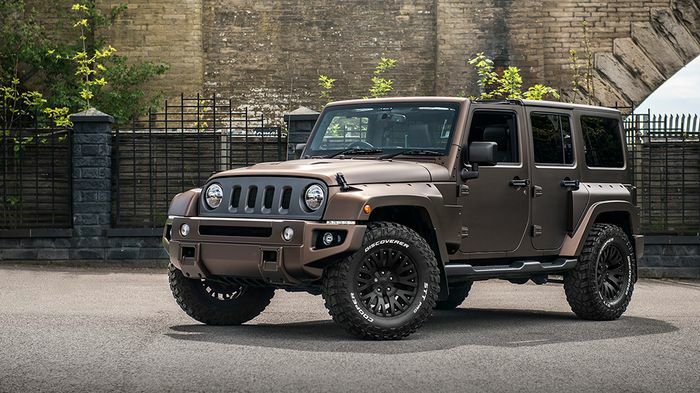 Kahn Design’s newest Jeep Wrangler design crept into our inboxes a few days ago, but we’ll own up to not seeing it right away. Let’s be honest, it’s quite a departure from the days when anything with a Kahn badge was… challenging. Showing much the same new degree of restraint as the company did with its run-out special edition London Taxi, the new 4x4 is all the better for it. 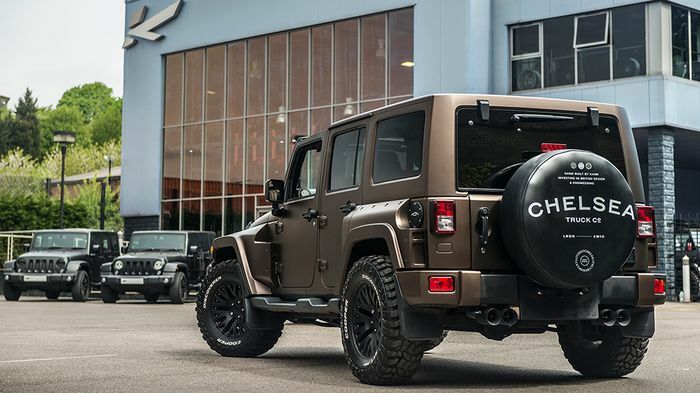 You’ll need to take a deep breath before saying the name, though; the Jeep Wrangler Chelsea Truck Company Night Eagle Black Hawk Edition is quite the mouthful. It combines a beefed-up exterior with a luxurious leather-clad interior. On the outside there’s an Iron Man vented bonnet with matching wider wings, a new bumper and a four-slot grille backed with ‘industrial’ mesh. New details span the likes of four ‘cross-hair’ exhausts measuring 100mm across, a Chelsea Truck Co. spare wheel cover, Tron ring lighting and LED headlights at the front, and bright new LED daytime running lights. It rides, predictably, on new wheels. They are satin black 7.5x17-inch Jeep ‘1941’ style items wearing 285/70 R17 Cooper Discoverer all-terrain tyres for maximum traction on that gravelly, muddy incline up to the Waitrose car park. Inside things are less reserved. 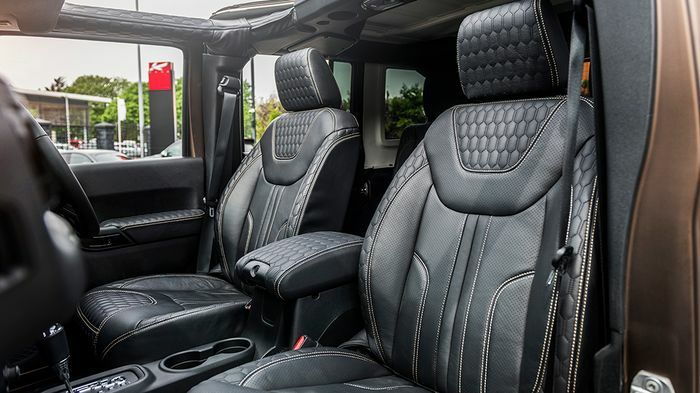 Black leather seats feature a dozen or more trim inserts, with contrasting stitching everywhere for a pretty busy look. Some of the trim inserts have been pressed into a honeycomb pattern that is echoed on the centre armrest and roof frame. 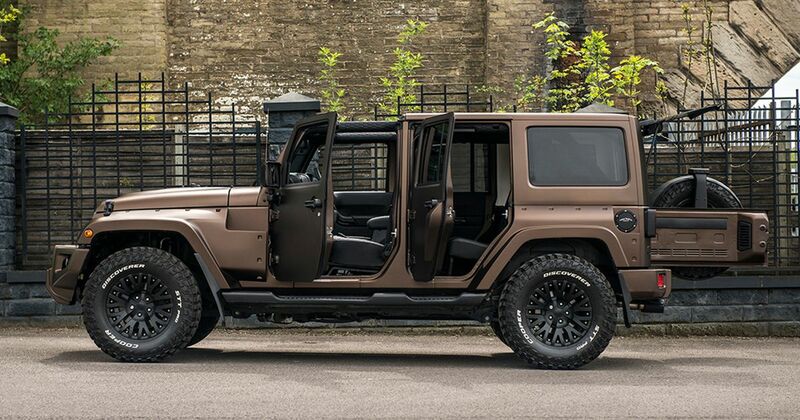 Naturally this Wrangler has removable roof panels for sunny days. It’s painted in a Volcanic Bronze satin finish that won’t like getting scratched, but it will look mega under direct sun. Under the bonnet is a 2.8-litre diesel engine, left in its standard 187bhp guise. It’ll grumble its way to 62mph in 9.7 seconds and max out at 99mph, but, in a Wrangler, that really is fast enough. Fuel economy is claimed at the 35mpg mark but we suspect any buyers of the Kahn-modified Night Eagle Black Edition will care more about the way it looks than how often they visit the pumps.